The Alabama Department of Transportation (ALDOT) recently announced that four teams submitted Statements of Qualifications (SOQs) in response to the Request for Qualifications (RFQ) for delivering the Mobile River Bridge and Bayway Project – a 12-mile project that will increase capacity along the Interstate 10 corridor in South Alabama. Four teams submitted applications for the proposed project, which includes three major components: a new, aesthetically pleasing cable-stayed bridge over the Mobile River; replacement of the existing Bayway; and five interchange modifications. The Mobile River Bridge will be a six lane facility with a minimum vertical clearance of 215 feet over the Mobile River to assure the viability of Mobile’s maritime industry. The reconstructed Bayway provides eight lanes of travel for 7.5 miles and will be built to an elevation above the 100-year storm surge level. The interchange modifications will assure safe and easy access to the Interstate and surrounding infrastructure. The Mobile River Bridge and Bayway project will be ALDOT’s first Public Private Partnership (P3). A P3 allows industry to bring innovation and expedite the project to assure timely delivery. In addition, ALDOT will use the Design-Build-Finance-Operate-Maintain (DBFOM) model for the MRB. Used successfully by public agencies throughout the nation and internationally to build critical infrastructure projects, the DBFOM model enables shared risks and rewards, and can help ensure project completion dates. ALDOT will review the SOQs responses to determine which teams will advance to the Request for Proposal (RFP) process of the project. Release of a short list of selected proposers and the draft RFP is set for early 2018. 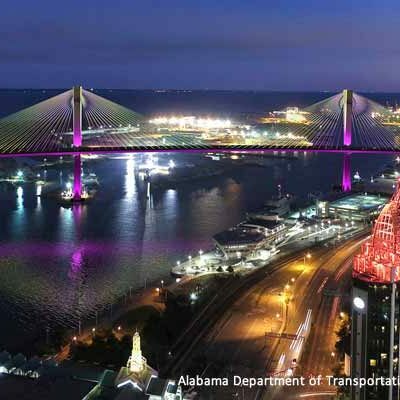 For more information about the proposed Mobile River Bridge and Bayway project, visit www.mobileriverbridge.com.